(from Greek ζίζυφον, zizyfon), commonly called jujube (sometimes jujuba), red date, Chinese date, Korean date, or Indian date is a species of Ziziphus in the buckthorn family Rhamnaceae, used primarily as a fruiting shade tree. Common names in Arabic are nabq, dum, tsal, sadr, zufzuuf (in Morocco) and sidr or 'azgwar', the last of which also means in Berber Ziziphus lotus. In Persian it is called anab or annab, a name also used in Lebanon. In Bulgaria is primarily grown in the area of the city of Stara Zagora, where is known as henap - probably from Persian through Turkish hünnap . In the Arabian Peninsula the names Sidr or Nabq refer to Ziziphus species other than Z. zizyphus. Duni Chand Khatri was a rich land lord of Patti town. He had five daughters. All were beautiful and talented. One day Duni Chand asked his daughters,"Tell me who provides you meals" Elder four daughter readily said that their father was providing them every thing. He is their benefactor. "It is God that sustains all living beings"
Hearing this reply Duni Chand was so enraged that he married Rajni to a leper. But Rajni did not care about it. She accepted the leper as her husband and served him with great love. In those days Guru Ram Das Ji was constructing a new city at Amritsar. Rajni took the leper with him and reached Amritsar. She met the devotees of the Guru When devotees saw that her husband was leper they took pity on her and provided him a room to live. She also joined the other devotees and was deputed to cook meals in the common kitchen. She was well contented with her fate. She was always contemplating the name of God. When she was going to join his duty, she used to take her husband with her. Making a suitable arrangement for his sitting under a shady tree, she used to go to the kitchen. One day she left him to sit under a Ber tree. When her husband the leper was sitting on the bank of the pond, he saw a pair of crows dipped down in the pool and flew away with their colour changing from black to white. Seeing this he concluded that pool did not contain an ordinary water, so he made up his mind to bathe in the tank. He reached near the pond and dipped into the water. When he came out he was astonished to see himself hale and healthy, He was no longer a leper. He walked as a young man and again sat under the shade of the Ber tree. When Rajni returned from langar she was unable to recognize him. When the young man convinced him her telling her the whole story; Rajni felt very happy. They met Guru Ram Dass Ji and told him the whole story The Guru was pleased to hear it. He told Baba Budha Ji that pond was the same holy place about which Gum Amar Dass Ji had foretold. 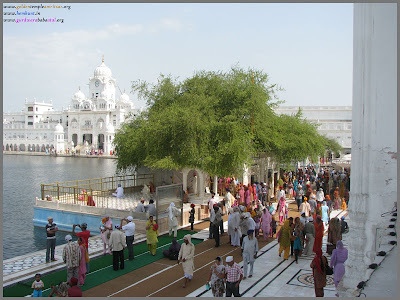 When the people of the area heard about the appearance of Netar pond they rushed to see and have a bath in it The tree under which the leper was sitting came to be known as Dukh bhanjani Beri as it relieves the pains and afflictions. A Gurdwara temple has been built near that Bed and thousands of people take bath near that Beri. Sanebuto natsume サネブトナツメ are used for yakuzen. Revitalizes the body, helps improve sleep.
. WKD : Food and Mecicine .